An international team of astronomers, including Professor Bob Nichol from the University of Portsmouth, has confirmed the discovery of the most distant supernova ever detected – a huge cosmic explosion that took place 10.5 billion years ago, or three-quarters the age of the Universe itself. The exploding star, named DES16C2nm, was detected by the Dark Energy Survey (DES), an international collaboration to map several hundred million galaxies in order to find out more about dark energy – the mysterious force believed to be causing the accelerated expansion of the Universe. A supernova is the explosion of a massive star at the end of its life cycle. 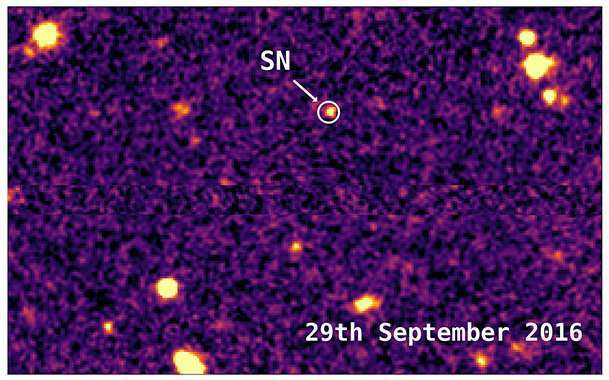 DES16C2nm is classified as a superluminous supernova (SLSN), the brightest and rarest class of supernovae, first discovered ten years ago, thought to be caused by material falling onto the densest object in the Universe – a rapidly rotating neutron star newly formed in the explosion of a massive star. 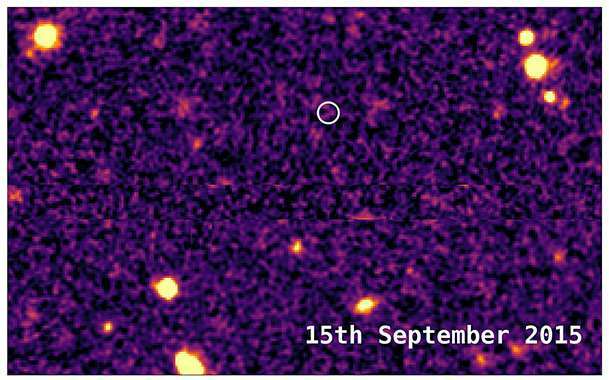 Study co-author Bob Nichol, Professor of Astrophysics and Director of the Institute of Cosmology and Gravitation, commented: "Such supernovae were not thought of when we started DES over a decade ago. Such discoveries show the importance of empirical science; sometimes you just have to go out and look up to find something amazing." Lead author of the study Dr. Mathew Smith, of the University of Southampton, said: "It's thrilling to be part of the survey that has discovered the oldest known supernova. DES16C2nm is extremely distant, extremely bright, and extremely rare – not the sort of thing you stumble across every day as an astronomer. "As well as being a very exciting discovery in its own right, the extreme distance of DES16C2nm gives us a unique insight into the nature of SLSN. 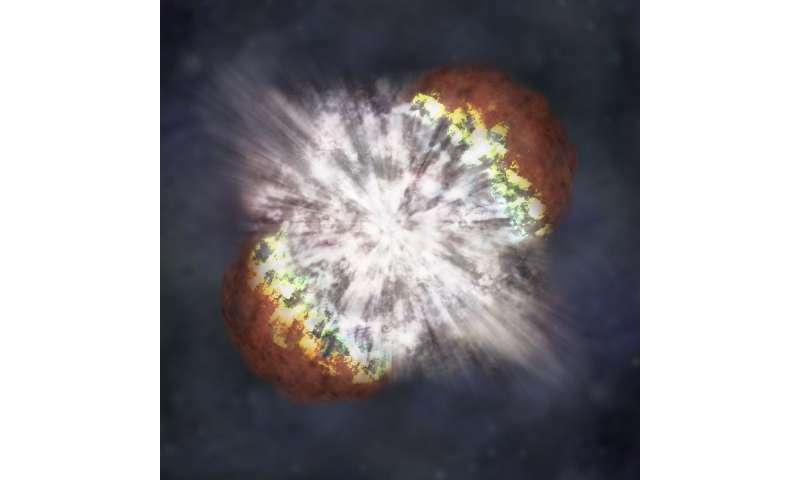 "The ultraviolet light from SLSN informs us of the amount of metal produced in the explosion and the temperature of the explosion itself, both of which are key to understanding what causes and drives these cosmic explosions." Study co-author Professor Mark Sullivan, also of the University of Southampton, said: "Finding more distant events, to determine the variety and sheer number of these events, is the next step. "Now we know how to find these objects at even greater distances, we are actively looking for more of them as part of the Dark Energy Survey." DES16C2nm was first detected in August 2016, and its distance and extreme brightness confirmed in October that year using three of the world's most powerful telescopes – the Very Large Telescope and the Magellan, in Chile, and the Keck Observatory, in Hawaii. More than 400 scientists from over 25 institutions worldwide are involved in the DES, a five-year project which began in 2013. Over five years (2013-2018), the DES collaboration is using 525 nights of observation to carry out a deep, wide-area survey to record information from 300 million galaxies that are billions of light-years from Earth.